Since today is Earth Day, it is the perfect day for me to share a couple of green related things that I have been talking over the past month. I hope you will take a moment to read through this post and learn more about the e-waste and Isidore recycling. Cost: FREE – but you must RSVP here. 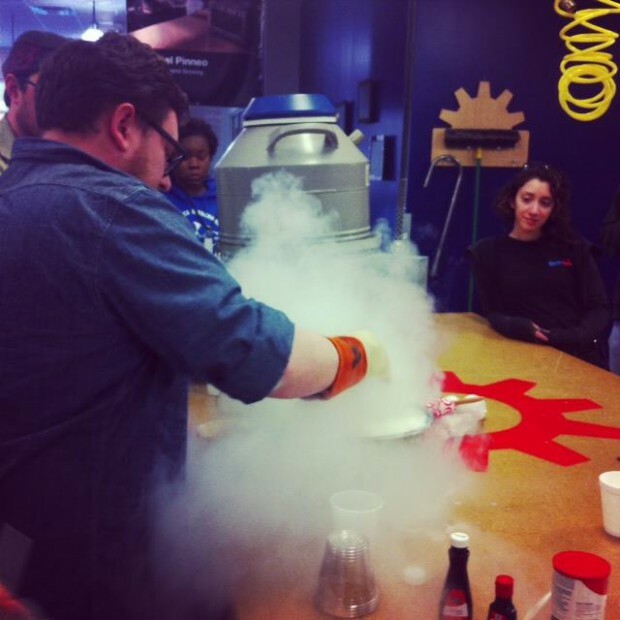 First – as part of the kickoff celebration, the TechShop team will be making and serving ice cream made with liquid nitrogen. If you haven’t been over to TechShop, yet – you need to make a point of stopping by to see the space. I wrote about TechShop last year before they opened. TechShop has been in Pittsburgh for over a year and there is a great, often free, community event happening at the shop each week. (I am such a fan of the place that I now work there as the social media coordinator for TechShop Pittsburgh). I was at TechShop last night for a great event organized by the Pittsburgh health coaches at Sweat and Butter, and got a sneak peek at some of the projects that TechShop will be showing off this week and in the near future. Keep an eye on @TechShopPGH and the TechShop Pittsburgh Facebook page for update. One of the speakers that I found most inspiring was Kabira Stokes who is the founder of Isidore Recycling. Isidore Recycling is an e-waste recycling business located in Los Angeles. Kabira’s talk was an eye opening lesson on the need for (and huge opportunity) in e-waste recycling. The short version of the story is that we have a lot of electronics that we aren’t using anymore, and these electronics are just being thrown in the trash. Some of things in TVs, cell phones, and old computers are pretty toxic and should not be disposed of in landfills. Aside from the environmental issues, many of the devices contain valuable materials that can be recycled and reclaimed. Kabira started Isidore Recycling as a way to reclaim those valuable materials and create jobs for incarcerated Angelenos who face barriers to employment. California has a a huge issue with recidivism – in 2012, 65% of people who got out of prison ended up going back to prison with in 3 years. Part of the reason that rate is so high is that is almost impossible for someone who has been incarcerated to find steady employment. Kabira was kind enough to give me and some of the other StartingBloc participants a tour of the Isidore warehouse. 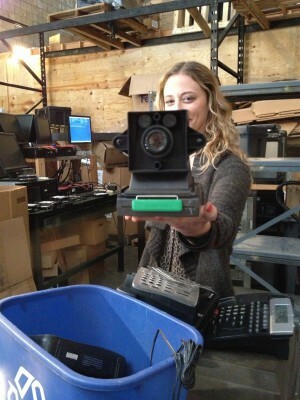 I left her warehouse and Los Angeles and returned to Pittsburgh with a great excitement for e-waste. I think this is an incredible business that not only addresses the challenge of what to do with old computers and cell phones, but also creates jobs in our community with out having to create more products to add to the waste stream. I am very interested in creating a business like Isidore Recycling here in Pittsburgh and if you know anyone else who would like to help with that please send them my way. What is the Green Electronics Challenge? The Green Electronics Challenge is an international online competition focused on preventing the creation of electronic waste. The challenge is organized via a partnership between Arizona State University, Tsinghua University, New America Foundation and Slate Magazine. To apply – submit an idea for upcycling electronics to Instructables. The deadline for submissions is May 31, 2014. It would be great to have some ideas from Pittsburgh submitted to the challenge. Please let us know if you are submitting an idea!